Your FiLIP can be worn either open or closed. To wear the FiLIP open, slide the end cap onto the end of your FiLIP to wear it open. To wear the FiLIP closed, determine the size of your child’s wrist, and then select from one of the options below. If your child’s wrist is small (4.8” or less), they will only need the latch spacer. If your child’s wrist is larger, then they will need either the latch spacer + medium extender (up to 5.2” wrist) OR the latch spacer + large extender (up to 5.6” wrist). 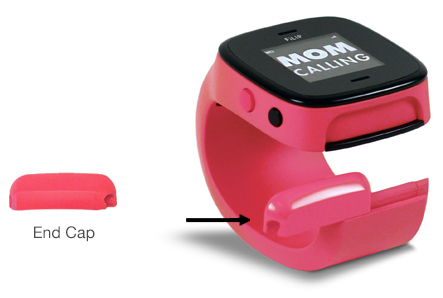 All spacers, extenders and end caps are designed to slide on and off the end of the FiLIP wristband, as shown. Do not try to push or snap them on or off, as that may cause them to break.